I can honestly say that my time playing in youth orchestras were some of the best years of my life. I absolutely adored being part of my youth orchestras – they changed my life from being a solitary school girl who was always practising her horn to feeling like I belonged somewhere with other young people just as passionately and dedicated to the music as I was. 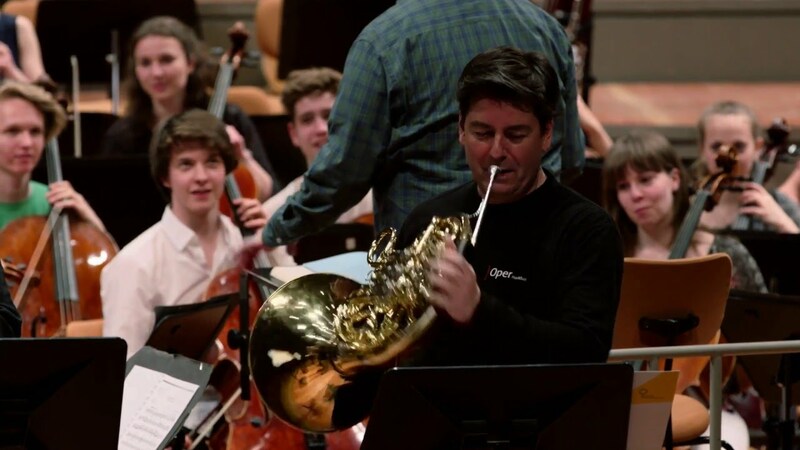 I am so very grateful for my time in my various youth orchestras and to the conductors who worked so tirelessly with us – the Stoneleigh Youth Orchestra, the National Youth Orchestra of Great Britain and the European Community Youth Orchestra. So I wanted to feature youth orchestra musicians of today on Sarah’s Music and was lucky enough to be joined by some members of the BJO – the German National Youth Orchestra – for this episode. Spending time with them brought back so many good memories for me. I felt so much like one of them – it was hard to remember that I wasn’t 16 any more. But I still had just as much fun with them as if I had been! This was a great programme to film, thank you so much to the BJO team, especially Sönke Lentz, for being so supportive of this project. The BJO does wonderful work and my whole team and I really enjoyed the passionate energy which the young musicians ooze. Thanks also to my Berlin Phil horn colleagues for being such good sports about the filming whilst having to play one of the most difficult pieces for horn, the Schumann Konzertstück. Do watch the concert on the Digital Concert Hall – it´s free and you can see -and hear – for yourself what a wonderful thing it is to play in a youth orchestra like this one. Enjoy!